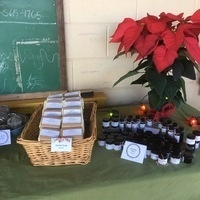 A wide selection of UGArden medicinal teas, soap, salve, lip balm, infused oils and homegrown luffas will be available. All items are crafted with herbs grown at UGArden using organic practices as part of a program to teach students how to grow and use medicinal herbs. The market will be in the lower barn area with parking at the greenhouses. Attendees will be shuttled to the barn on a Christmas hayride. Samples of several of the teas will be available, and gift wrapping will be offered. Additionally, there will be a bonfire and Christmas music.